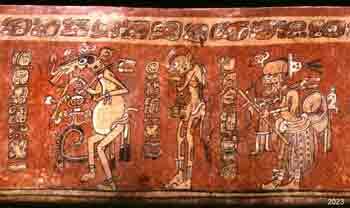 The Maya depicted scenes on vases that included animals, both natural and supernatural. You may search the Database for other vases showing animals by entering words such as monkey, deer, jaguar, birds, bats, or make choices by scrolling through the Iconography table in the Selection area. 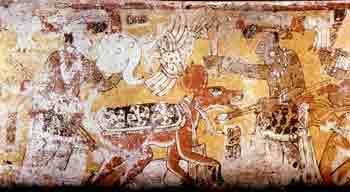 The animals on this vase are ways (the Maya word for animal spirits). These are (from left to right); the fire-peccary, a coatimundi, a deer with eyes on eye stalks, and a monkey. File no. K1743. The three characters on this vase are supernaturals or ways; a deer, a monkey, and the skeletal god of hunting who carries a basket and a conch-shell trumpet. File no. K2023. The ceremony of removing a deers antlers before he is sacrificed is being performed. His blanket, marked with crossed bones, identifies the deer as a sacrificial victim. File no. K2785. Painted on this vase is a trio of supernatural animals who appear as musicians. The fox plays a tall standing drum, the rabbit plays a turtle carapace, and the coyote shakes rattles. 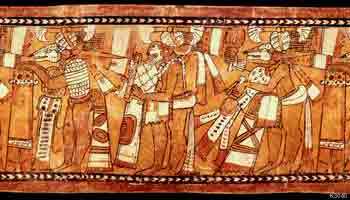 It is believed that the ancient Maya dressed in animal costumes and played similar instruments during ceremonies. File no. K3040.